Sorry... the 2017 Nissan Frontier is no longer being sold as new. Instead, take the first step to a great deal on 2019 Nissan Frontier with a free price quote! 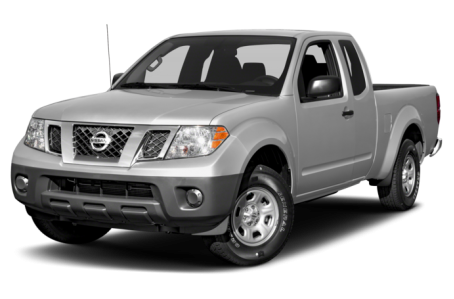 The 2017 Nissan Frontier is a light-duty, mid-size pickup truck. It competes with the Honda Ridgeline, Toyota Tacoma, and Chevrolet Colorado. This year, it remains largely unchanged, but the trim level options have been revised. Four trims are available: the S, SV, Desert Runner, and PRO-4X. The SL is no longer available. There are two available cab sizes, King (which seats four) and Crew (seats five). Crew models are offered with a choice of short or long bed sizes as well. Wheel options range from 15- to 18-inches and a factory spray-in bedliner is available as well. For 2017, the Frontier continues unchanged in the looks department. The Frontier has a muscular appearance with its flared-out front and rear fenders. It still retains its prominent V-shaped front grille and color-contrasting lower fascia. Available features include body-color front and rear bumpers and front fog lights. King Cab models feature the Frontier’s base engine, a 152-hp, 2.5-liter four-cylinder that makes 171 pounds-feet of torque and is mated to a five-speed manual or automatic transmission. Crew Cab models are only available with the larger V-6 which is optional on the King Cab. It is a 261-hp, 4.0-liter V-6 which makes 281 pounds-feet of torque and is mated to a six-speed manual or a five-speed automatic. The V-6 also ups towing capacity to 6,500 pounds. Rear-wheel drive is standard for all models. 4-wheel drive is optional only for the V-6 models. Inside, the Frontier offers a good number of standard features for a pickup, with Bluetooth connectivity, air conditioning, cruise control, and steering wheel audio controls coming on every model. The Frontier also offers two glove boxes for extra interior storage. Plenty of creature comforts are available, including leather upholstery, heated front seats, a navigation system, and a premium stereo. Standard safety features include all-disc antilock brakes, an electronic stability system, and six airbags. For safer reversing, a backup camera is optional, as are hill start assist and hill descent control.